14th May 2018, Manila - The FIFA World Cup is coming!! 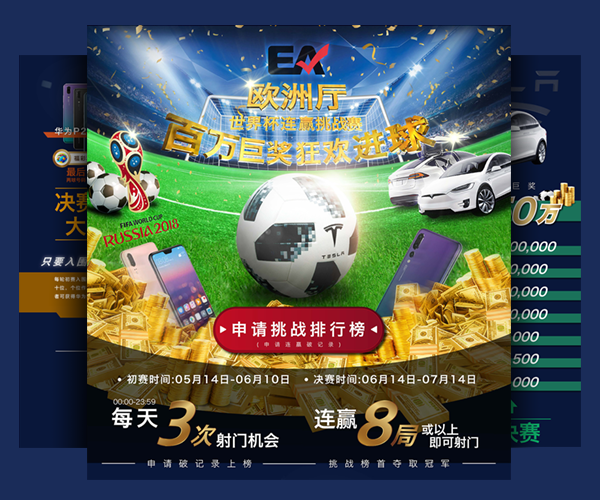 In order to celebrate this event with players, EA launched a “The Winning Streak Competition of European table” from 14th May to 14th Jul 2018 (GMT+8). During the promotion, players' winning streaks achieve 8 or above in the European baccarat table (table with letter "Z" at the beginning, no baccarat type restriction), they can apply for boarding on the Top 100 Ranking list. As usual, EA prepared fabulous prizes, there are over million prize pool and the Top 1 player can get the Tesla Model X Sport Car. Let’s come to join us!